Hello, and welcome to the Monroe County Clerk's Office. As the County Clerk of Monroe County, I would like to take a minute to tell you what we do in our office. The County Clerk is the official recorder and record keeper for most legal documents. These documents include births, marriages, deaths, wills, deeds, mortgages, releases and much more. Our office takes care of the county's accounts receivables, payables, and payroll for county employees. We issue marriage license, hunting and fishing license and we also provide free notary services. We probate wills, and assist in the administration of estates. We also preserve county documents. The County Clerk also serves as the Clerk to the Monroe County Commission. These responsibilities include scheduling of meetings for the Commission and taking minutes for such meetings. The Clerk serves as the Chief Financial Officer for the county and prepares the County's annual financial statement, helps prepare the coming year budget, maintains and processes all of the county's financial needs including payroll, accounts payable and receivable. Our office is open Monday through Friday from 8:30 am till 4:30 pm, excluding legal holidays. We do not close for lunch. The Monroe County Clerk and his staff truly understand the meaning of public service. We are here to serve and assist you in any way possible. Donald J. Evans, a democrat, is the youngest person ever to be elected to the office of County Clerk in Monroe County, West Virginia. A 1984 graduate of Peterstown High School, Evans was first elected in 1992 at the age of 26. He was re-elected in 1998, 2004, 2010 and 2016. Donald is a member of the Peterstown United Methodist Church and is involved in many community activities. He is co-founder and Former President of OUR KIDS, INCORPORATED. Founded in 1998, OUR KIDS, INC. is a non-profit organization whose mission is to provide for the betterment of the children of Monroe County. Evans is a former youth football, baseball and basketball coach. He spends countless hours assisting charitable organizations with fund raising activities. He also enjoys visiting the schools throughout the county and talking about his job as a County Clerk. 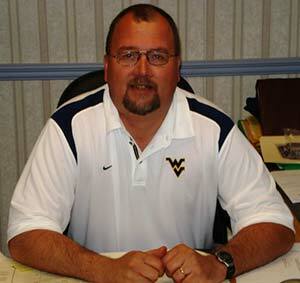 Evans is currently the one of the Vice-Presidents of the West Virginia Association of Counties. Evans also volunteers as the county's grant writer. Donald is the proud father of two sons, Andrew and Ben.